She had a couple egg hunts leading up to Easter. We had one in our neighborhood last weekend and then another at her preschool on Thursday. 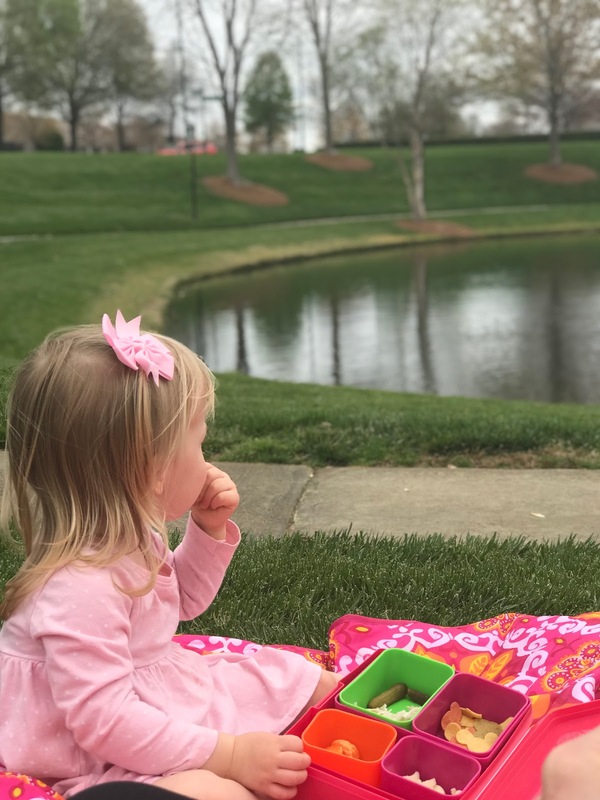 By then, she started to realize that sometimes the eggs have chocolate in them so by the time we got to the Easter Day egg hunt, she was shaking all the eggs as she picked them up to be sure she was happy with what was inside. Haha! Corey was home for Good Friday and had a little administrative-type work to do but was able to sneak away long enough for us to enjoy a picnic in the park. 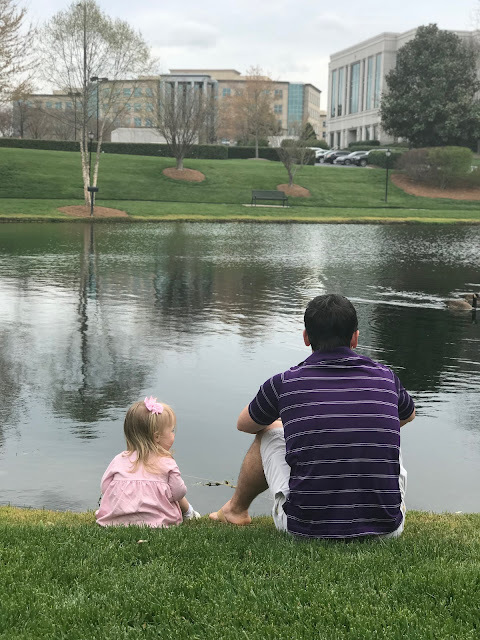 Madeline loved feeding the ducks and eating her "picnic basket" outside. On Sunday, she woke up to a fun little Easter basket. I shared how I went about deciding what to put in it (no candy) here. Then, Corey made Madeline pancakes while we listened to the service online. Then, he took Madeline to play in our neighborhood playground so I could get dressed in peace. It was the best little treat for me. My parents came and shared a few little Easter gifts for Madeline and then we went to our country club for their Easter lunch. We did this last year, too, and it was such a fun little celebration. Of course the bonus was a great meal that I didn't have to cook or clean up after. She enjoyed a little visit with the Easter Bunny. She wasn't afraid of his like Santa but definitely a little skeptical. She wanted to follow him around and talk to him but wasn't so sure about sitting on his lap. After lunch, we enjoyed one last egg hunt and then a ride on a cute little train the club had rented out. Madeline was so excited to ride the "Choo Choo" and was talking about it the rest of the afternoon. It was such a great holiday with our little girl! I hope your Easter was wonderful, too! Amen for the club meals we do not have to cook! She looks like she loved all the festivities and I love her basket goodies and glad i took to the same theme you did. she did not miss the candy since she got so much on her other hunts. What a fun Easter! I agree with you about holidays being so special now too!